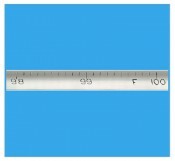 Mercury-in-glass incubator thermometers are made to specific ranges as required. Lengths and immersions are available to suit specific applications. A chromed brass right angle case is available.